China's Stock Market Feeling the Loss of Its "Smart Money"
Subject: China's Stock Market Feeling the Loss of Its "Smart Money"
− one = six Required Please enter the correct value. One reason behind the brutal 8.5% loss suffered by China's stock market today (Monday) is that its wealthiest investors – China's "smart money" – are no longer around to help prop up prices. 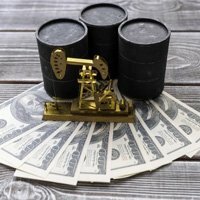 In the United States, "smart money" is a term describing experienced, well-informed investors who understand how to use market movements to their advantage. China's smart investors did very, very well in the year leading up to China's stock market crash. In the 12 months prior to mid-June, the Shanghai Index rose 150%. China's smart money got in early for the most part and enjoyed the ride. 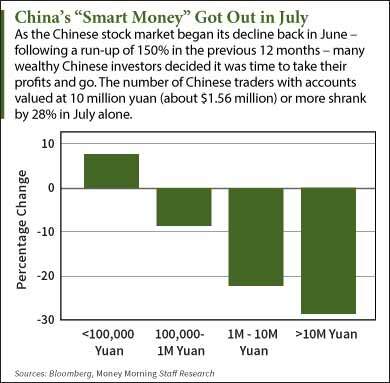 But when China's stock market began to falter, the smart money took the hint and started for the exits. According to Bloomberg, the number of traders with holdings worth 10 million yuan ($1.56 million) or more declined by 28% in July, according to China Securities Depository and Clearing Corp. data. The number of traders with holdings worth between 1 million and 10 million yuan fell by 22%. Meanwhile, the number of accounts with holdings of less than 100,000 yuan (about $15,613) rose by 8%. Of course, some of that was the result of the decline of China's stock market. But China's smart money clearly saw a chance to do a little profit-taking ahead of a broad market sell-off. "Wealthy investors, who have been through bear markets, are better at exiting," Hu Xingdou, an economics professor at the Beijing Institute of Technology, told Bloomberg. And the heavy government intervention in China's stock market presented the smart money an easy way to exit their positions and preserve most of their gains. The Chinese government and entities acting on its behalf conveniently bought up the shares the smart money wanted to sell.